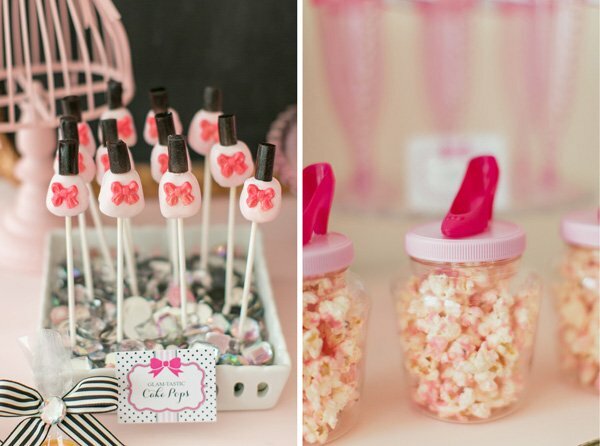 HWTM Contributor Maureen Anders of Anders Ruff here to share this Gorgeous Glam Barbie Spa Party by Xiomara Roman of A Styled Fete. 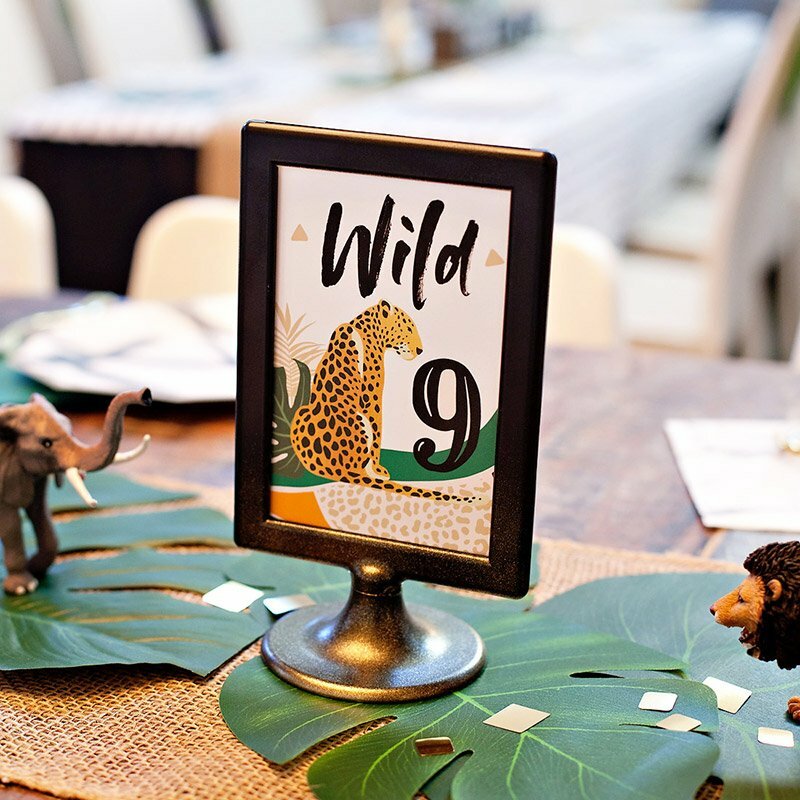 The birthday girl received the ultimate pampering with her friends at this celebration, complete with face masks, manis, pedis, and gorgeous sweets and treats! 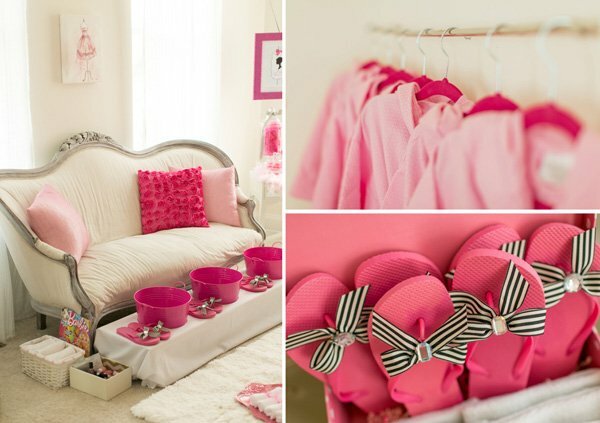 DIY pink bow “charger plates” made out of paper plates – so clever!! 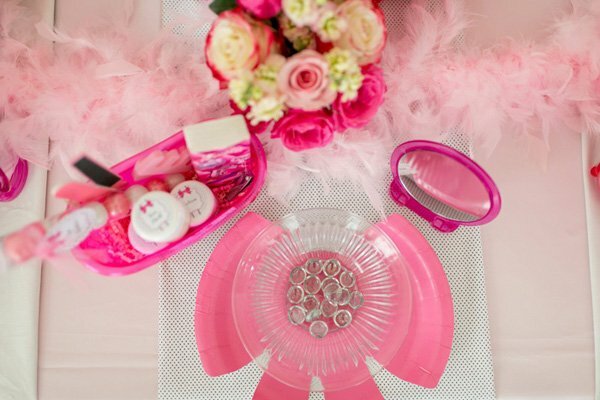 Individual Spa Kits at each place setting with Barbie tissues, face mask, sugar scrub, lotion, a nail clipper and file for the ultimate pampering treatment. 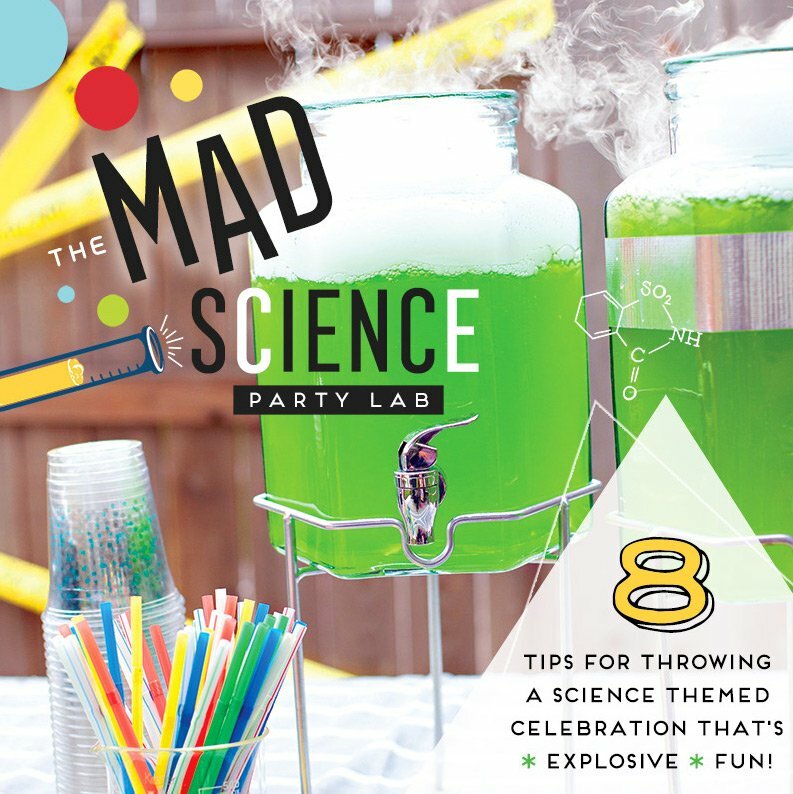 I had so much fun designing this party for my daughter’s 7th birthday. 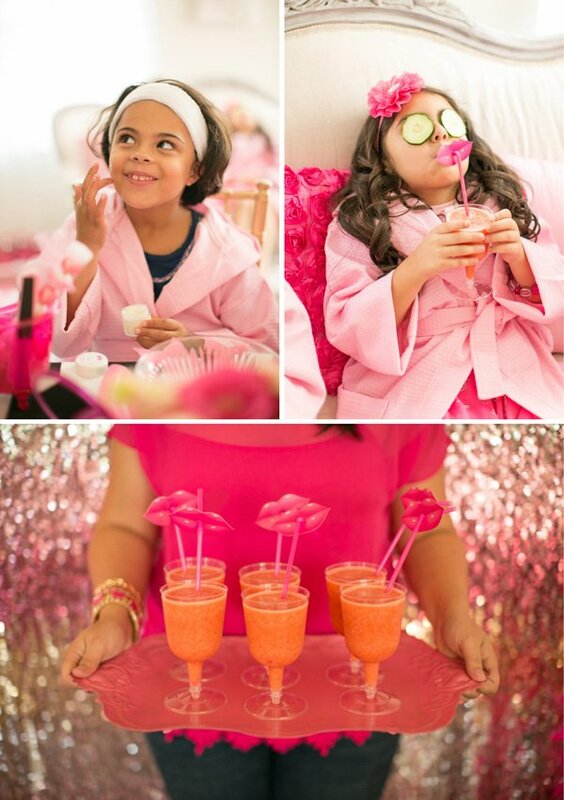 She adores getting pampered, getting her hair done and let’s not forget her love for anything and everything pink! 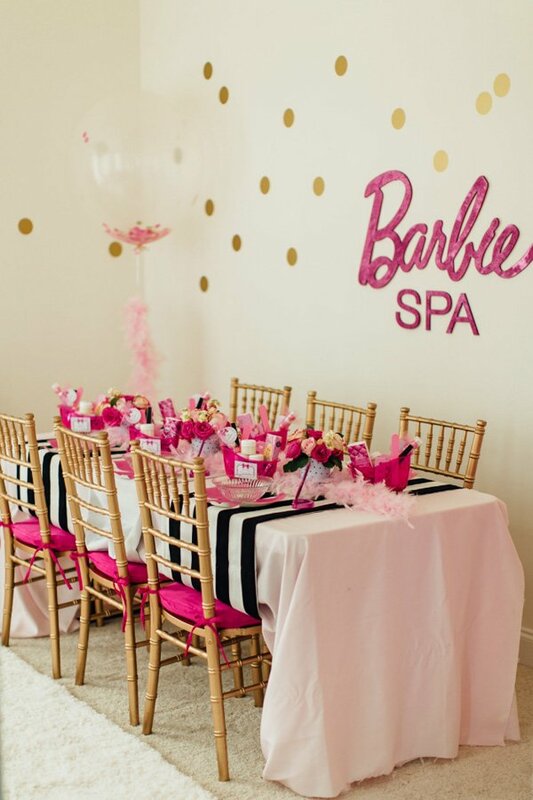 A Barbie Spa party seemed like the obvious choice to celebrate her special day with five of her closest friends. 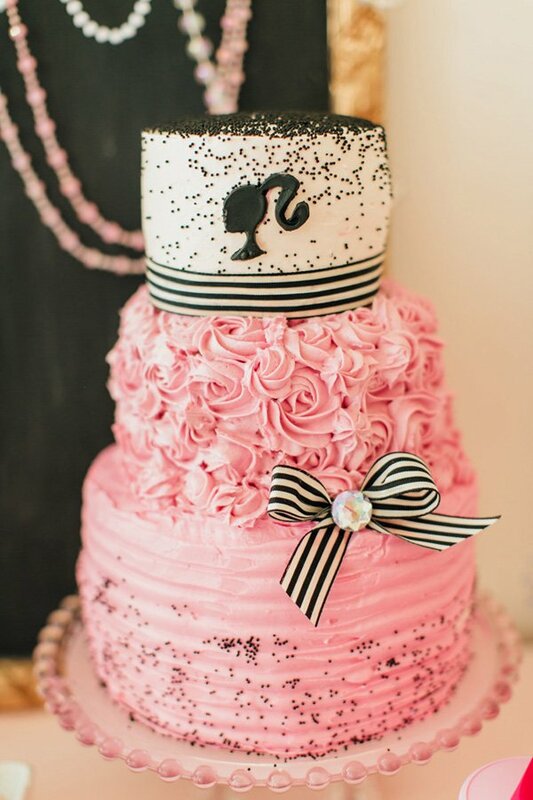 First, we decided on a pink, white and black color scheme. 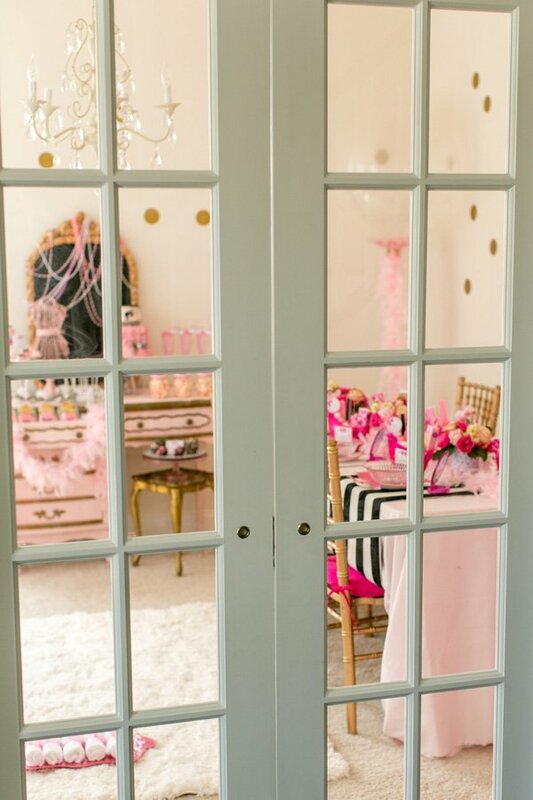 I wanted the party to feel light and feminine with a touch of glam. 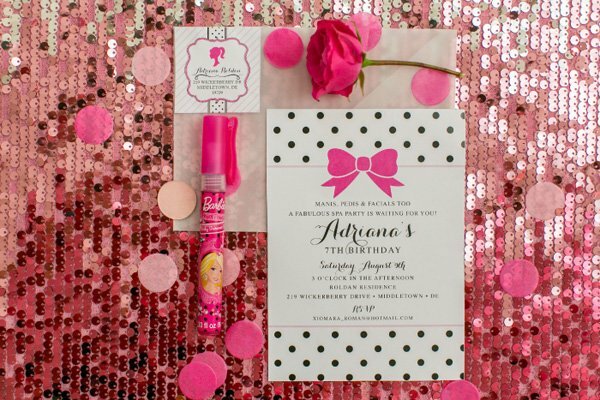 My friends at Anders Ruff created the gorgeous invite and matching printables featuring polka dots and bows. 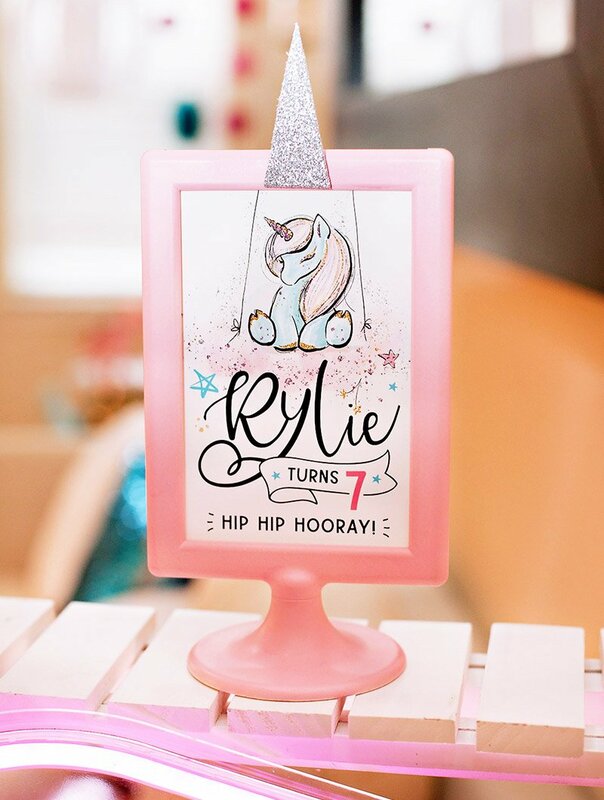 Ten Twenty Three Designs made a custom Barbie logo sign I used to create a “real” spa feel in the room. 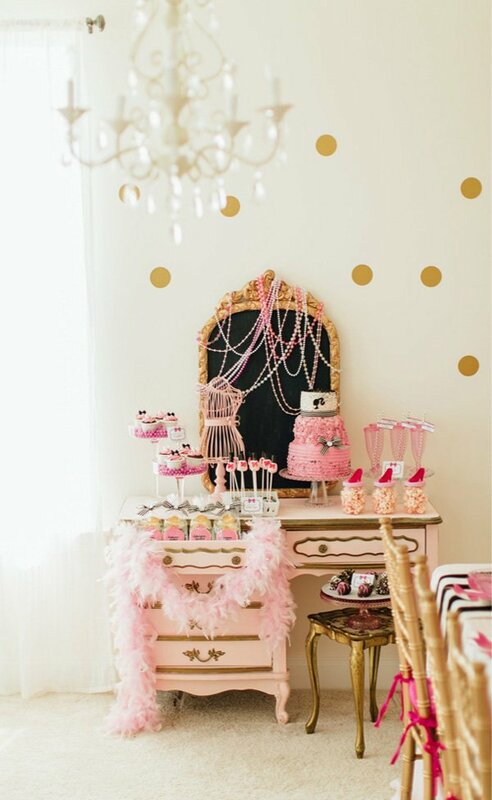 Gold confetti decals on the walls surrounded the glittery sign and dessert table. 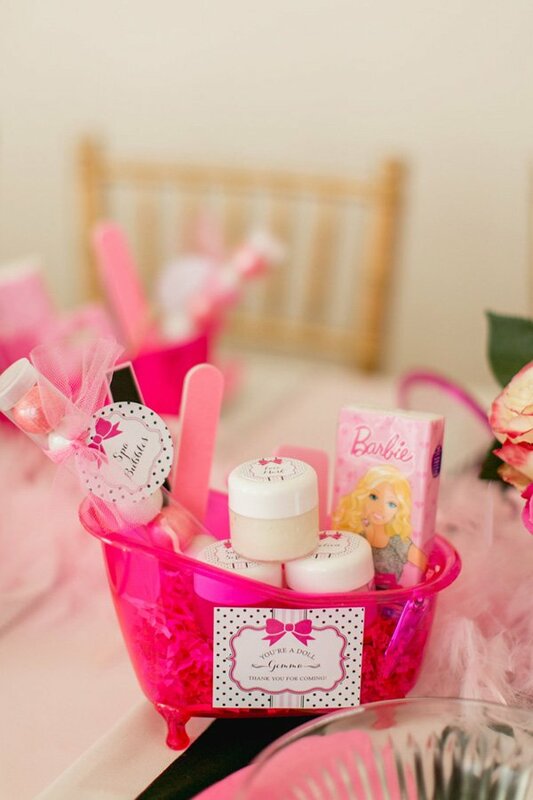 Mini ” bath tub” containers with Barbie tissues, face mask, sugar scrub, lotion, a nail clipper and file to be used on their treatments were set up on our main table. Small mirrors and glass bowls filled with warm water were provided to be used while removing their face mask treatment. I made some DIY plate chargers by cutting a bow shape out of paper plates and placing them under the glass bowls at the table. 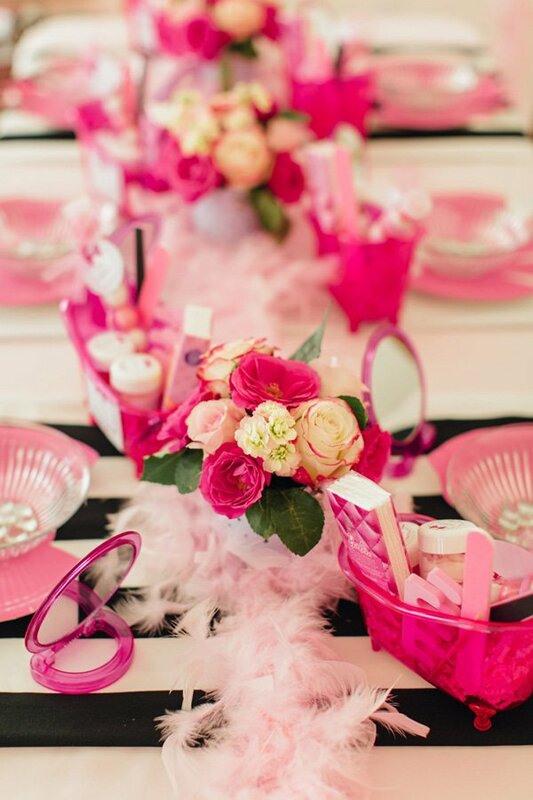 Beautiful flowers in different shades of pink were arranged in polka dot tins served as centerpieces alongside light pink feather boas. 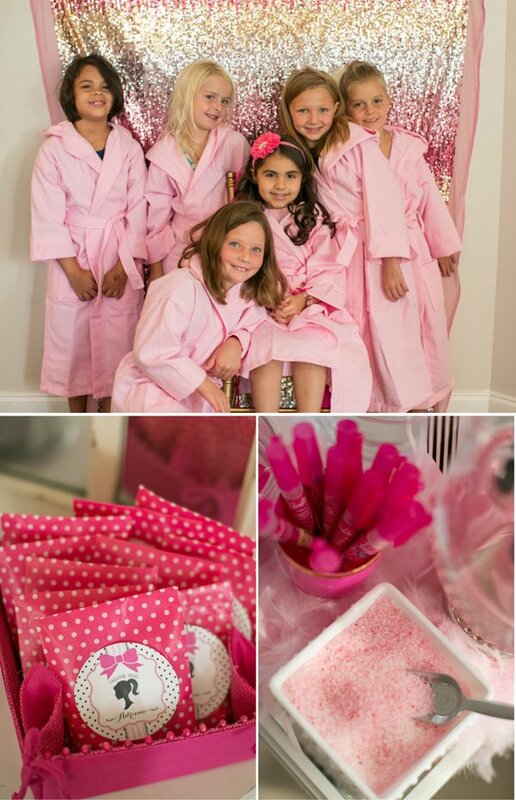 Pink spa robes made our guests feel cozy and fancy while they entered the “Spa”. 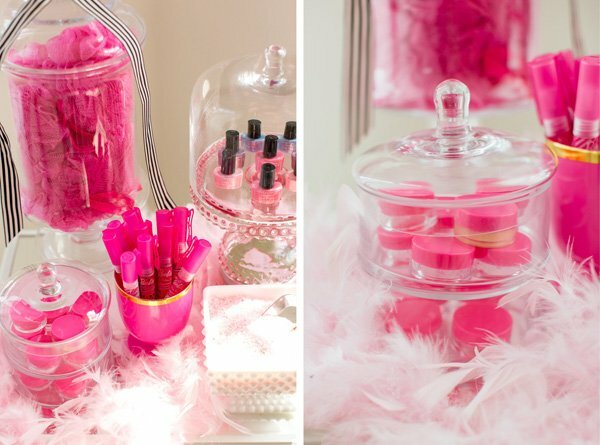 They proceeded to the “Pink Beauty Bar” where they selected a nail polish color ( theirs to keep) for their pedis. 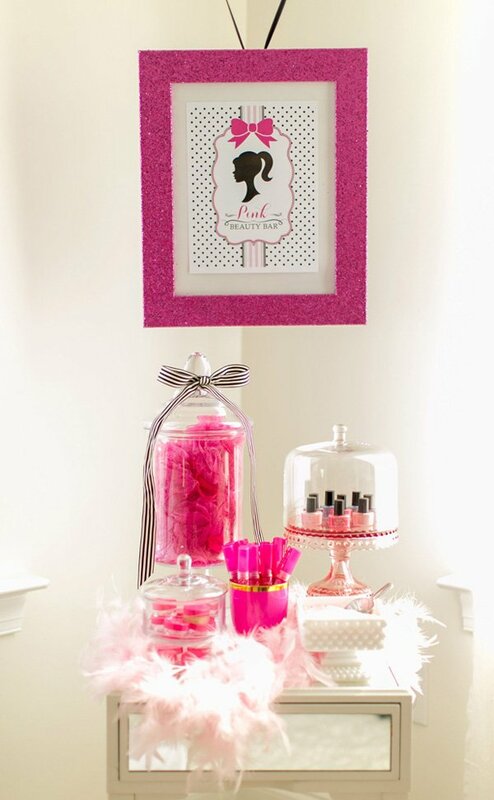 The Beauty Bar included nail polish, Barbie shimmer spray, loofahs, containers for lip gloss making activity and pink bath salts. While getting their treatment done they read Barbie magazines, rocked to Barbie music and sipped on strawberry banana smoothies. After pedis were done, they all got to wear matching flip flops with bows and sparkles! Next, they got to apply a yogurt/cucumber face mask on their pretty faces and wear silly cucumbers on their eyes to “relax”, this was definitely a highlight for them as they couldn’t stop giggling! The girls also made their own lip glosses and played “musical manicure” where they all painted each of their nails a different color. After all the pampering fun it was time for treats! 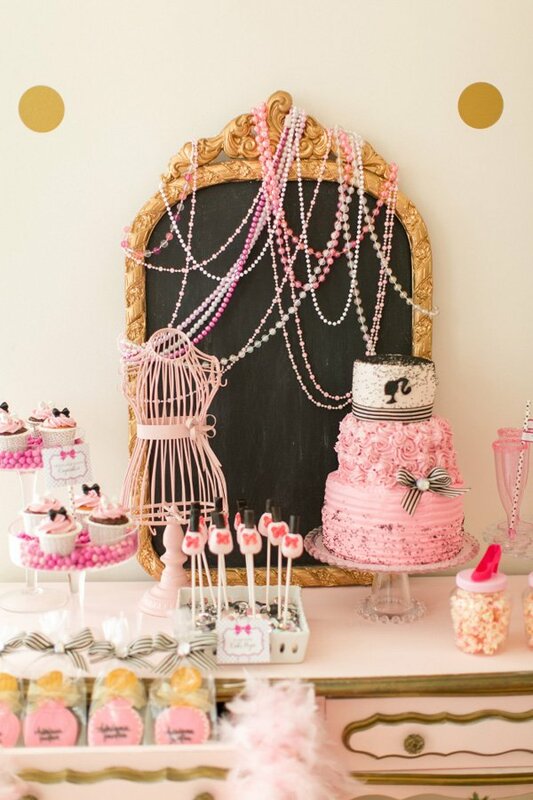 I wanted the dessert table design to look like it was Barbie’s vanity– it had beaded necklaces hanging from its “mirror”, perfume cookies, bows on cupcakes, nail polish cake pops and pink shoes on sweet popcorn jars. 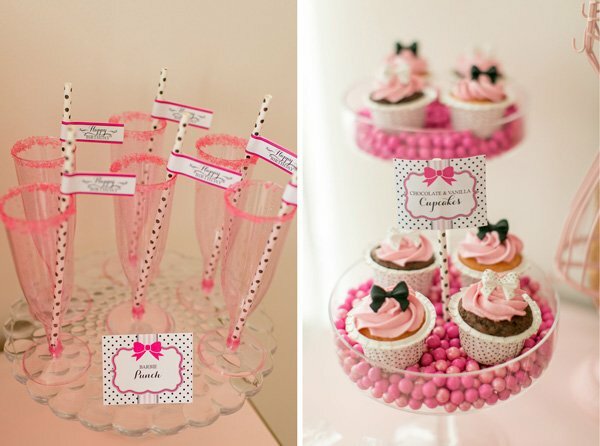 Everything a girl could need, all edible! In addition to these delicious treats we had chocolate strawberries and a beautiful sprinkle cake made by my sweet mom. My daughter and her friends had an amazing time getting pampered and having a little girl fun that made them feel a little more grown up for the day! Where did you get the little bathtubs at? 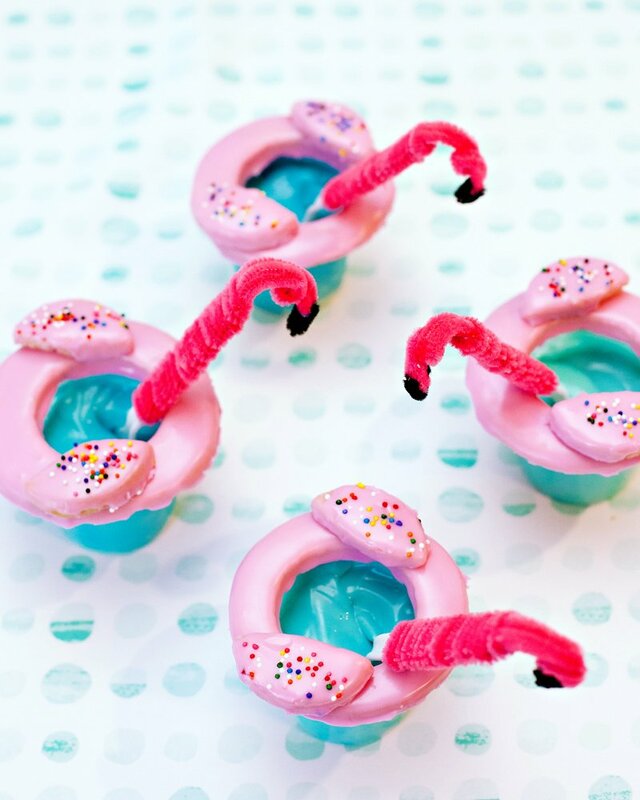 Where can you get the little bathtubs? I have been searching for these for months for my nieces birthday party. Where did you find the pink mini bath tubs at?